Recently Google drive for android app has been updated with number of interesting features. 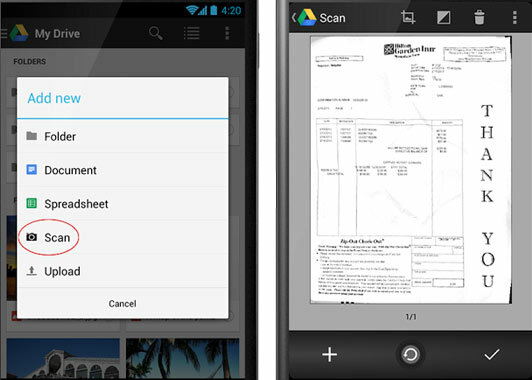 Now users can Scan documents, receipts and letters for safe keeping in Drive with this app. Google made lot of new changes to the app including program, new interface, new display and scanning functionality. The scanning feature is probably the most interesting novelty. It allows you to scan a PDF document and send it automatically to your account. That’s really a great feature cause we can easily save our documents online now. You can also crop your photo, choose to keep your document in color or black and white, change the image quality and paper size. If you are in a well light environment, you will get very good scanning results. This is not the case when the light is not sufficient. Also the best thing about Google drive for android is that this app now will recognize text in scanned documents using the optical character recognition (OCR) technology, means you can search by the contents of the document to find it later. The Google Drive for Android has been revamped. Like the desktop version, you now have access to a “Grid” mode. It gives you a quick overview of your files and folders. Finally, when you work on a document sheet calculation, it is possible to change the font, size and font color. Also now the Google Drive app comes with Cloud Print support, meaning you can print anything from Google Drive with a Cloud Ready printer. Download the updated Google Drive for Android app from Google Play using the link provided below.